FlyingPics.in has been launched, exclusively for the people of Kurnool, Vizag & Vijayawada. Founded by Saikrishna Gadwal & Pratap Reddy Agile final year students of G.Pulla Reddy engineering College, Kurnool. On how Flying Pics came into existence, one of the Founders said, "These days we are facing huge problems like traffic jam. In such traffic no one turns his/her head to see hoardings/advertisements around. Thus we got an idea of "Flying Pics". Ads will go directly to the customers house personally with their photos. By this we can save paper & a lot of money which is spent for advertising & that too ads on hoardings are for a period of time but advertisements behind a photograph is life long". Around 1,20,000 people in kurnool have internet access, their target is to reach max audience in Kurnool and then in Vizag & Vijayawada. Day by day website hit count is increasing. 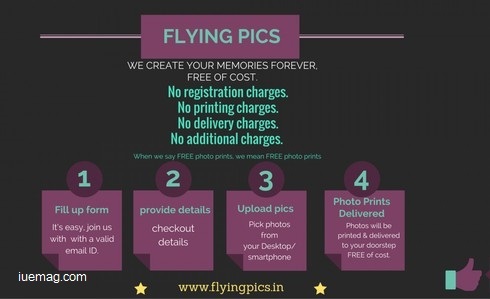 You can now Log in to www.flyingpics.in to place your order. Any facts, figures or references stated here are made by the author & don't reflect the endorsement of iU at all times unless otherwise drafted by official staff at iU. This article was first published here on 31st October 2015.